Chows have been described as having the nobility of a lion, the drollness of a panda, the appeal of a teddy bear, the grace and independence of a cat, and the loyalty and devotion of a dog. Chows are known to be dignified and aloof, as befits a breed that was once kept in imperial Chinese kennels. While the origin of the Chow Chow is unknown we do know that they are a very old breed. The oldest known dog fossils, dated back to several million years ago, are very similar in structure to the Chow Chow. Pictures on Chinese pottery which looked like the Chow Chow date back as far back as 206 BC. This ancient breed is believed to have originated in Mongolia and Northern China, slowly moving south with the nomadic tribes of Mongolia. Early depictions of dogs resembling the Chow Chow appear in pottery and paintings from the Han Dynasty (206 BC to 22 AD). We know of at least one Chinese emperor who appears to have kept 2,500 pairs [5,000 in total] of Chows as hunting dogs. In addition to hunting, the dogs were used to guard their owners' possessions. On the down side, their fur was used to trim coats and their flesh was considered a delicacy. British merchants in the late 18th century travelled with some of these bearlike dogs in their cargo ships. Miscellaneous items, including these dogs, were referred to as "chow chow" and the name stuck to the breed. In 1781, the Chow was described, in a British book called "Natural History and Antiquities of Selbourne", by naturalist Gilbert White. His neighbors brought home 2 Chow Chows from Canton (now Guangdong), and Gilbert White then included them in his observations of country life. Fanciers say the breed has changed very little since White first wrote about them in the 18th century. A century later Chow Chows began being exported on a regular basis. In the United Kingdom, the reigning Queen, Queen Victoria, who loved dogs, took an interest in this unique breed and this boosted their popularity. The first Chow Chow to made an appearance at an American dog, the Westminster Kennel Club in 1890. It's name was "Takya". Chow Chows were all the rage among the rich and famous during the 1920s. They even made it to the White House, where President Calvin Coolidge and his wife housed 'Timmy' a red Chow, and 'Blackberry' a black chow. 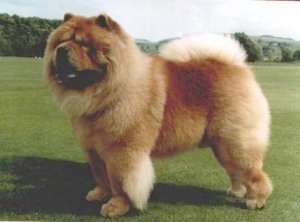 Analyst Sigmund Freud was also a Chow fan, and his daughter Anna kept and bred many Chows. More recent fans include Martha Stewart & have appeared with her on her TV show and in commercials she has starred in. •	Independent, dignified, intelligent, stubborn and aloof ~ cat like personality. •	Important owners don't allow their Chow to 'take over'. •	Need to be well socialized with dogs, lifestyles and other people from a young age. transferring this loyalty to new owners. •	Require regular grooming/brushing at least 3x a week. •	Do well living in apartments/condos. •	Like all breeds ~ need daily exercise. The temperament of the Chow is one that seems to be full of inconsistencies. While they can at times be quite aloof, they are also a great family pet who loves children. In a single 60 second period, they can go from being joyful and eager to please to stubborn and utterly obstinate. Despite all this, they make for a wonderful pet and many people will keep not just one but two Chows. Owners love them so much that, upon the passing of their Chow, they will immediately go out and replace their companion with yet another. It is a breed that has a definite following in the public. Their temperament is said to extend from their days in China and Mongolia where they were not only used as working dogs but also as meat and fur since resources in the region were few. Because of this, Chows were not considered pets or given the benefit of a single owner as the attachment would make them harder to kill. This accounts for their somewhat self governing nature. They did, however, become quite useful as guard dogs for temples, aligning themselves with temple masters and aggressively rejecting all other unknown persons and animals. Over the years, breeders have successfully worked to bring forth a Chow with a family focused nature. While the Chow can be somewhat willful they are still a refined, sophisticated breed. They will take an aggressive stance when guarding their home or family but do not tend to resort to full on aggression unless pushed. In cases where they do rush to aggression, it is often found they have not been properly socialized. When directed to do or not do something, it has to make perfect sense for the Chow; otherwise, they are likely to balk at the command. These dogs are generally not the types who do tricks for the fun of it, although this is not true in all cases. The Chow can do well with other animals, as long as they are introduced and raised with them from a very early age. Unfortunately, the Chow's temperament is simply one of the most misunderstood of the canine world. It is a breed that draws his or her own needs for attention from family members and has little concern for the validation or approval of others. An owner who is like minded is likely to have the most successful relationship with the Chow breed. For those wanting to take on the ownership of a Chow, the best plan of action is early obedience classes and extensive socialization. This is a breed that needs an owner with a firm temperament of his or her own in order to keep power struggles at bay. As always, consistency will be the name of the game. This leads to a well balanced and even tempered dog who feels secure in their own environment. Dogs that have a good sense of security are well known for making the best of companion and family dogs. For the most part, a Chow is a healthy breed and is no more or less susceptible to the list of common dog ailments than any other type of dog. However, there is some susceptibility to specific Health conditions due to the construction of the breed's anatomy. In keeping with their self assured temperament, Chows are a breed that truly like to stay clean. While there are exceptions, most very much enjoy the grooming process. While clipping the coat of a Chow can actually be damaging to the two layers of it naturally dense coat, regular weekly grooming is what keeps the breed free from mats and tangles. Regular grooming also builds a stronger bond an owner and their Chow, something that is quite necessary for this breed's temperament. It is often recommended that grooming be done twice weekly with a good stiff bristled comb or slicker brush. Some find applying a coat dressing keeps static to a minimum and also helps to thoroughly condition the coat. Because of their special thick coat, wet bathing should take place only when needed, or not more than once per month. In fact, dry shampooing is the most recommended method of upkeep for this breed. The Chow is one that has at least two periods of heavy shedding. While it may seem their heavy coat would be uncomfortable for summer, shaving the breed is highly looked down upon as it not only takes away the dogs natural defenses, it can also lead to sunburned skin. The recommended course of action is to be sure all dead hair is groomed out of the natural coat. With the Chow, it is always important to brush down to the skin. Otherwise dirt, debris and moisture can become trapped in the hair, which then kinks up causing bothersome skin problems. The Chow is not one that will demand an extensive amount of exercise but to ensure good health, regular outings are a wise decision. Because Chows can weigh up to 70+ pounds it is necessary to ensure they do not give way to hip dysplasia through inactivity. Regular exercise also gets them out of their own yard or environment and maintains a high level of socialization, something this breed consistently needs. While some Chows are more tolerant of the leash than others, daily walks and romps in the park can be an ideal option. It is important to remember most Chows have a mind of their own making it essential to leave this breed on their leash at all times. While it is commonly joked that a Chow would much rather stay inside and watch TV with its owner, there are some Chows with the type of personality that love running obstacle courses and other similar trials. Events set up specifically for this purpose are often arranged by local chapters of Chow appreciation groups. These organizations can often be found online or by calling a local kennel clubs or breeders. Information for training and entry fees are often readily available. Training a Chow is a matter of great importance that requires a good amount of diligence. To be effective, training must start at a very early age, establishing the owner as the dominant or alpha in the relationship. As with all dogs, consistency is an absolute must. Understanding the temperament of the breed will be the number one thing that allows an owner to keep conflicts and power struggles to a minimum. While the Chow has great loyalty to its owner, it simply does not rely on anyone outside of itself for validation. They are self governing and autonomous breed, a trait that is the result of their extensive 3,000 year old history. For successful training, only firm consistent commands will suffice. The breed simply does not respond to begging, pleading or cajoling; nor do they respond to heavy handed, harsh or inhumane tactics. In order for the breed to fully accept a command, they must know that there is a basis for the action they are about to perform. While there are many exceptions, this is not a breed known for willfully performing tricks and stunts. Though it may seem the Chow is stubborn and inflexible, in reality it is a breed with a strong sense of self. Those looking for a type of dog that is bent on pleasing its master are not a good match for the Chow. Socialization from an early age is also a necessity for this breed. Bred throughout the centuries to be guard dogs, it is in their nature to take an aggressive stance when new situations present themselves. While they do not often carry through with aggression, socialization can help them realize not every situation needs the same kneejerk reaction. Chows can be just as loving as any other type of dog.